The New York Times (NYT) is as rabidly anti-Trump as any other newspaper in the world. So recently (June 1, 2018) when the NYT carried an article claiming that “we ran out of words to describe how good the job numbers are” it was the strongest endorsement of Mr Trump’s economic policy that has created remarkable economic growth and employment in the US. Here are some astounding numbers for the US economy. It is adding, on average, about 225,000 jobs per month. The unemployment rate has dropped to 3.8%, the lowest level in 18 years, and unemployment among black Americans is at 5.7% which is the lowest ever in recorded history. Combine this with the fact that average hourly earnings have risen by almost 3% over the last year, and you have even the NYT gushing and using words like “Salubrious,” “salutary” and “healthy” for the US economy. Estimates are for the US economy to grow at over 4%, numbers not seen since Mr Reagan was president in the 1980’s. There are lessons here for Mr Modi to learn. India’s employment growth is at best tepid. Lack of good data and a large informal sector which remains mostly unmeasured prevents an accurate assessment of job creation in India. Common sense tells us that an economy growing in the 6% to7% range must be creating new jobs. So, yes new jobs are being created in the economy, but the number of jobs is nowhere large enough to meet the demand for employment. Here is a critical aspect of US job creation–the jobs are being created by businesses and not the government. The Trump administration has introduced favourable and supporting policies that allow businesses to deploy capital, expand production and hire people. And that’s the first lesson Mr Modi must learn from the US economic miracle: jobs are created in the private sector and not the government. The government’s primary role is to create an environment that allows the private sector to take risks, expand production and hire more people. The second lesson for Mr Modi to learn is the importance of reducing taxes because taxes take away capital that businesses could use to hire people. Mr Trump’s first significant legislative act was to reduce the corporate tax rate from 35% to 21%, and, importantly, the cuts were made permanent. For years, the 35% tax rate was preventing US companies from investing domestically and forcing them to move their production overseas. As a result of tax rates being dropped to 21%, there was a flood of companies that decided to shift production to the US. Taxes are critical to economic growth–the lower they are the faster the economy grows and greater the number of jobs created in the process. It is crucial, therefore, to keep the tax rate as low as possible to incentivise companies to invest in new plants and create employment. Indian policymakers have always confused tax rates with tax revenue. They believe that higher tax rates will inevitably lead to higher tax revenues, while in fact, the opposite is true. In the US, tax revenues increased 5.2% after the tax cuts and total taxable income increased by 13%. With GDP growth now projected to increase to around 4.1% from the earlier projection of 2.7%, tax revenues to the public exchequer are expected to increase by about 10%. The fallacy that higher rates produce higher revenues is based on the idea of getting a larger cut of a fixed size pie. In reality, lower tax rates incentivise businesses to add capacity which in turn increases taxable earnings. A smaller piece of a much bigger pie results in higher tax revenues for the government even at lower tax rates. Mr Jaitley mentioned reducing corporate tax rates in his budget speeches but quite injudiciously indicated that the reduction in corporate tax rates would be made gradually over the years. That just adds to the uncertainty. Corporates would rather wait for the end game to play out before committing new capital investments. What he should have done was what the Trump administration did–make a substantial and permanent tax cut in one fell swoop. The third lesson Mr Modi can learn from Mr Trump, and probably the most important one in the Indian context, is the importance of reducing the regulatory burden on businesses. Mr Trump, being a businessman, understands, better than anyone, that regulations and red tape are a business killer, and since businesses create jobs, regulations destroy the job creation process. Mr Trump has launched an aggressive assault on regulations. Immediately upon taking office, he signed an executive order that required the elimination of two existing regulations for every new regulation created, and the additional requirement that the cost of any new regulation is offset by eliminating regulations with the same costs to businesses. He also created a separate department assigned with the specific responsibility of identifying and cutting redundant and useless regulations. Indian businesses are choked by regulations–not only their sheer number, but also their complexity, redundancy, and lack of consistency. Tens of thousands of useless rules including hundreds of archaic labour laws are a huge impediment to business development and job growth in India. If Mr Modi is serious about growing the economy and creating jobs he needs to pass an executive order similar to the one passed by Mr Trump that would require the elimination of five old regulations for every new one created. A separate Ministry to identify and destroy useless, redundant and conflicting regulations can be established to assure the private sector that the government is serious about creating an environment conducive to new business development, investment and job creation. The economy is a complex ecosystem with millions of stakeholders. 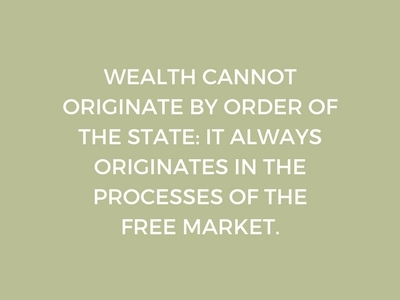 Its functioning is best left to free market forces. Mr Modi should come to grips with the reality that he cannot affect the economy or create jobs by tinkering at the margin or imposing tax terrorism on businesses. What he can and must do is create an environment that reassures businesses that their capital investments will not be subject to arbitrary and capricious government regulations and that their profits will not be taken away by unreasonable and excessive taxation. I hope for his own sake Mr Modi learns soon how economic growth is created.